Kristen Bicknell has just bested a field of 954 players, to take down Event #51: $10,000 Ladies No-Limit Hold'em Championship, pocketing $173,922 and a white gold bracelet for her efforts. In only 120-hands, and just over five hours of play, Bicknell made her first WSOP cash a memorable one, also awarding Canada with their 10th bracelet of the series. The final table started with the quick elimination of Cindy Kerslake , before action slowed right down, with eight-handed play lasting almost two hours. Connie Bruce was eliminated next, when her was out flopped by Chris Priday's . We then lost Amanda Baker, Eleanor Gudger, Connie Bruce and Shana Matthews in the space of just 25-hands, before being left with just three. Both Leanne Haas and Kristen Bicknell shared most of the chips in play, as Julie Monsacre started three-handed play with just over 10 big blinds. She lasted three hands, before she committed the remainder of her stack with against Kristen Bicknell's . The board ran out , to see Monsacre miss her straight draw on the river, as we headed to heads-up play. Heads-up lasted only seven hands before Bicknell raised to 40,000 and Haas made the call. Haas checked the flop as Bicknell threw out a continuation bet 50,000. Haas called and checked the turn. Bicknell bet 130,000, before Haas raised to 280,000. Bicknell made the call and the river was dealt on the river. Haas thought for a moment, before moving all in for 627,000 and getting called by Bicknell after she asked for a count. Bicknell rolled over her which had Haas dominated, after she tabled her . A big hand to finish on, with the kicker proving the difference in the end. 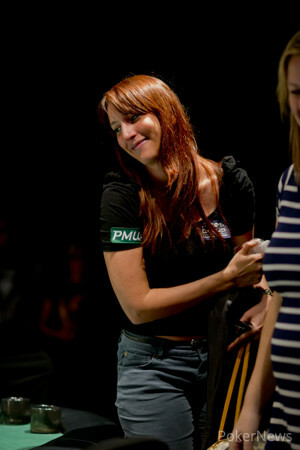 A great result for the Australian (Haas), who walks away with just over $100,000, not bad for her first ever WSOP cash. That concludes our coverage of Event #51. Be sure to keep your browsers locked to PokerNews.com for the rest of the 2013 WSOP and beyond. Hand #118: Kristen Bricknell completed the small blind and Haas checked her option. Haas bet 47,000 on the [ks7h10] flop and Bicknell folded. Hand #119: Haas raised to 45,000 and Bicknell folded. Hand #120: Bicknell raised to 40,000 and Haas made the call. Haas checked the flop and Bicknell bet 50,000. Haas called and checked the turn. Bicknell bet 130,000 and Haas raised to 280,000. Bicknell made the call and the river was dealt. Haas moved all in for 627,000 and Bicknell called. Both players had a pair of kings but the ace kicker of Bicknell played to eliminate Haas in 2nd place. Bicknell opened to 40,000 and was called by Haas, as the flop came down . Haas checked to Bicknell, who threw out a continuation bet of 50,000, which was called. The fell on the turn, as both players checked their options. The completed the board, as Haas slid out a bet of 100,000, which was enough to take down the pot. Haas called the big blind, and Bicknell checked, as the flop came down . Both opted to check their options, as the fell on the turn. Bicknell checked once more, as Haas placed out a bet of 44,000 which was called. The completed the board, as Bicknell checked for the third time, before Haas kept up her aggression, betting out 75,000 in chips. Bicknell thought about her decision for almost a minute, before raising it up to 200,000, which was enough to take down the pot, as Haas mucked her hand shortly after. Bicknell opened to 40,000, before Haas slid out a raise to 100,000 in chips. Bicknell stared down the raise, before opting to bump it up to 225,000. Haas made the call, as both players saw the flop come down . Haas checked her option, as Bicknell then threw out a continuation bet of 175,000. Haas made the call, as the fell on the turn. Haas quickly checked, as Bicknell went into the tank. She then reached for her chips, before announcing all in. The bet had Haas covered, and she sat motionless, before reaching for her chips, and cutting them out, seeing how much she had in her stack. She then thought about her decision for a few minutes, looking back and forth from the board to her opponent, before eventually mucking her hand, relinquishing the pot to Bicknell. Haas limped into the pot, and Bicknell checked, as both players saw the flop . They both then checked down the and , before Bicknell rolled over her hand, showing king-high, which was enough to take down the pot. Heading into heads-up play, Kristen Bicknell will have an advantage of just 5,000 in chips over Leanne Haas. 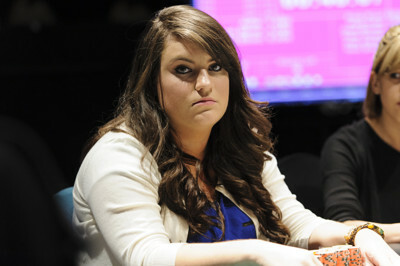 Hand #111: Leanne Haas received a walk in the big blind. 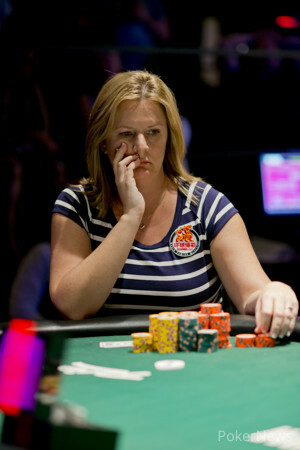 Hand #112: Kristen Bicknell raised to 40,000 from the button and the blinds folded. Hand #113: Julie Monsacre moved all in from the small blind and Kristen Bicknell called from the big. The board ran out and Bicknell wins with a pair of aces, eliminating Julie Monsacre in 3rd place. Play has resumed. Here are the updated chip counts. Hand #111: Leanne Haas folded on the button, Julie Monsacre moved all in and Kristen Bicknell folded. With the conclusion of that hand, the ladies are leaving on a 20-minute break. We will see you back here shortly. Kristen Bicknell opened to 34,000 from the button, which was enough to take down the pot. Julie Monsacre moved all in from the small blind, which was too much for Shana Matthews, who folded her hand. 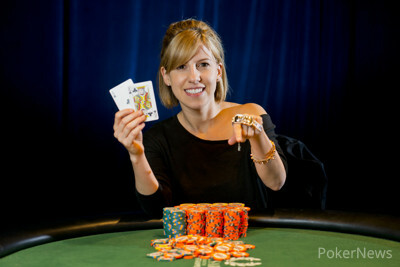 Leanne Haas opened to 32,000, which rewarded her with the blinds and antes. Leanne Haas received a walk, as she took in the small pot. Shana Matthews opened to 32,000 from under the gun, and was called by Leanne Haas on the small blind. The flop came down , as Haas slid out a bet of 40,000. Matthews made the call, as both players watched the fall on the turn. Haas checked, before Matthews moved all in, which was snap called. Matthews was unable to find a ten or jack on the river, with the completing the board, as she was eliminated in 4th place, just short of the next break.